The Digital Research Library of Illinois History Journal™: The History of Illinois' Fort St. Louis du Rocher (aka: Rock Fort) on Starved Rock. The History of Illinois' Fort St. Louis du Rocher (aka: Rock Fort) on Starved Rock. During the winter of 1682 and 1683, men working under the direction of Jacques Bourdon d'Autray, a trusted member of explorer René-Robert Cavelier, Sieur de La Salle (Sieur de La Salle being a title only) inner circle, began construction of Fort Saint Louis du Rocher (Fort St. Louis) at today's Starved Rock State Park on the Illinois river . The Illinois tribe called it "Ahseni" - the French called it "du Rocher" which means "The Rock." The Starved Rock State Park location of Fort Saint Louis du Rocher on the Illinois River. A wooden palisade was the only form of defense that La Salle used in securing the site. Inside the fort were a few wooden houses and native shelters. 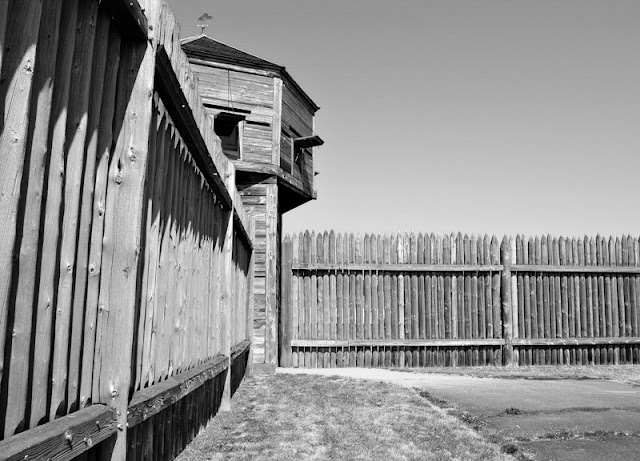 A wooden palisade frontier fort fence. The French intended Fort Saint Louis du Rocher to be the first of several forts to defend against English incursions and keep their settlements confined to eastern America and protected entry to France's claim of the Mississippi Valley (the Indians called the Mississippi River, "Sinnissippi," meaning "rocky waters") through the Illinois Country. The fort protected La Salle's men from attack—namely from the Iroquois Indians—enemies of the French and local tribes. In March of 1683, the fort was completed, named Fort Saint Louis de Rocher, built on the butte (an isolated hill with steep sides and a flat top -- similar to but narrower than a mesa) which provided an advantageous position for the fort above the Illinois River. Accompanying the French to the region were allied members of several Indian tribes from eastern areas, who integrated with the Kaskaskia were the Miami, Shawnee, and Mahican. The tribes established a new settlement across the river from the base of the butte. The French called the village both the Grand Village du Kaskaskia and La Vantum ("the washed"), also known as the Grand Village and the Old Kaskaskia Village which was near present Utica, Illinois. The fort was at the center of what history calls "La Salle's Colony," a place where trade was conducted between La Salle's agents and the estimated 20,000 Native Americans who lived in the Starved Rock region. The fort was diplomatic headquarters for relations between the Indians of the Colony and the French. 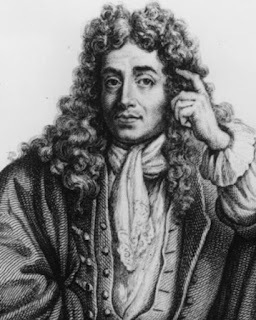 Joseph-Antoine le Fèbvre, Sieur de La Barre, the Governor General of New France (Canada), gave authority to Louis-Henri de Baugy, Chevalier de Baugy to take control of Fort St. Louis du Rocher on the Illinois River from Henri de Tonti in 1683. In February, 1684, the fort was besieged by a force of some 500 Iroquois for eight days. Despite limited ammunition and provisions, the defenders withstood three assaults, and the Iroquois were forced to abandon their attacks and withdraw the way they had come. 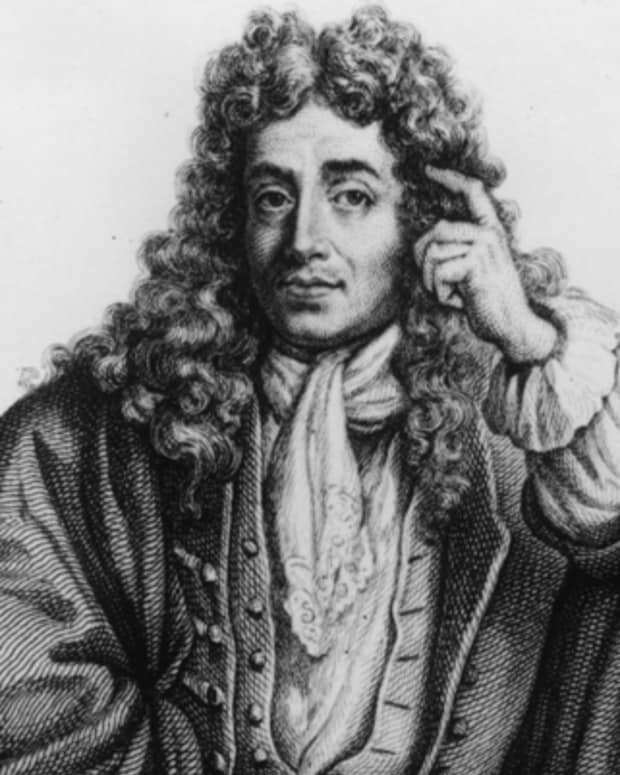 In 1685, La Salle was given back control of Fort St. Louis du Rocher by the French King Louis XIV. Henri de Tonti erected Fort Miami on Buffalo Rock. For the next eight years command at the fort changed hands between La Salle, Henri de Tonti, Henri-Louis Baugy, and then back to Tonti. After La Salle's five year monopoly ended, Governor Joseph-Antoine de La Barre wished to obtain Fort Saint Louis du Rocher along with Fort Frontenac for himself. By orders of the governor, traders and his officers were escorted to Illinois. By 1689, inter-tribal bickering caused the non-Illinois tribes to leave the Starved Rock region and return to their former homes in today's Indiana, Lower Michigan, and elsewhere. With the natural resources dwindling, the nutrients in the soil sapped by years of successive farming, and with concerns of another bout with the Iroquois, the Illinois sub-tribes who lived at the Kaskaskia Reservation, located about a mile upstream and on the opposite side of the Illinois River, abandoned their camps and relocated to Lake Peoria. Without customers left to support trade efforts on Starved Rock, the French abandoned Fort Saint Louis du Rocher and built a new fort near the new Illinois camps by Peoria. During the French and Indian Wars, the French used the fort as a refuge against attacks by Iroquois, who were allied with the British. The Iroquois forced the settlers, then commanded by Henri de Tonti, to abandon the fort in 1691. 1691 marks the end of French occupation of the fort on the Rock and colonization efforts in the Upper Illinois River. French troops commanded by Pierre Deliette may have occupied Fort Saint Louis du Rocher from 1714 to 1718; Deliette's jurisdiction over the region ended when the territory was transferred from Canada to Louisiana. Fur trappers and traders used the fort periodically in the early 18th century until it became too dilapidated. No surface remains of the fort are found at the site today. Fort St. Louis du Rocher Burned and Colony Broken Up. So long as the fur trade was conducted by Henri de Tonti and La Frost, the Indians were well pleased with their manner of doing business, but when it came under the supervision of the Governor of Canada, a new order of things was introduced, which caused much dissatisfaction. The governor appointed unscrupulous agents to conduct the trade, who swindled the Indians by selling them worthless articles, such as counterfeit jewelry, knives, and tomahawks etc., made of pot-metal. These traders paid the government a certain duty on all pelts shipped to Canada, and no one was allowed to trade with the Indians unless authorized to do so by the governor. The duty consisted of a certain number of skins out of each cargo, which the traders compelled the Indians to furnish, otherwise their value was deducted on making payment. The Indians being imposed upon by these swindlers, an unfriendly feeling sprung up between them. There were other causes of ill feeling between the French and Indians, among which was the marriage relation. A Frenchman having married a young squaw would put her away as soon as he found another one more attractive, thus changing his wife at will according to his fancy. Although the priests would not tolerate bigamy among their Countrymen, yet they were willing to accept a marriage fee once a month, twice a week, or as often as the applicant desired a new wife. The young squaws were fond of wampum (beads), rings and other trinkets, with which they would adorn their persons, and the one giving them the most presents they were willing to marry. It was the height of their ambition to marry a white man, notwithstanding they were liable to be put away at any time, if their lord found one more attractive than themselves. Under the Indian code of morals, a squaw, if found unchaste, was punished by cutting off one ear or branded on the forehead, but there was no law to prevent them marrying every day in the week, or as often as an opportunity occurred. On a warm morning in the latter part of the summer of 1718, while most of the occupants of Fort St. Louis, after a night of revelry and debauchery, were still asleep in their bunks, when suddenly aroused by the presence of the avengers. Captain La Mott, awakening from his morning nap, was astonished on being confronted by about three hundred warriors, armed and painted as for war. The Captain inquired the object of their visit, when Jero, the head chief, informed him that they were here to destroy the fort. The chief ordered the warriors to fire the buildings, and in a few moments the block-home, store-house and dwellings were in flames, all of which were burned to the ground. Thus Fort St. Louis was destroyed, after standing thirty-six years, and being the head-center of the French settlement in Illinois. On the destruction of the fort the colony was broken up; some of the traders returned to Canada, others to the French settlement at Cahokia, but the greater portion to Peoria Lake, where a colony had been established seven years before. In the summer of 1805, a party at Kaskaskia, learning from tradition that a large amount of gold had been buried within the stockades of Fort St. Louis, went in search of it. At that time the location of Fort St. Louis was unknown. History and tradition alike failed to point it out; but they knew it was on a rock washed by the rapid current of the Illinois River, and a short distance above the great bend in the river. On Buffalo Rock they found as they supposed relics of the fort, and here they spent a number of days in searching for the hidden treasure. But finding nothing, they returned home and published an account of their expedition in the newspapers of that day. In this account they describe the remains of the fort on a large rock, located on the north side of the river, and from that time forward it was conceded that Fort St. Louis was built on Buffalo Rock. It has already been shown that Buffalo Rock did not answer the description of the place spoken of in history, but the natural advantages between these two rocks for a fortification, could not escape the observation of a man with La Salle's shrewdness. Buffalo Ruck contains on its summit several hundred acres of land, is only about sixty feet high, and accessible at various points, consequently it would require a large force to hold a fort thus located. 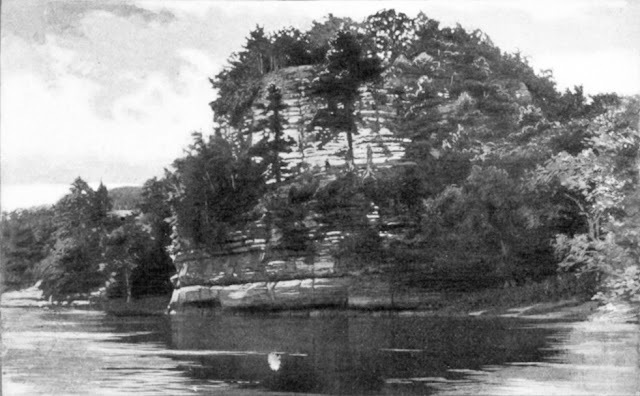 Whereas, Starved Rock is one hundred and thirty-six feet high, contains on its summit less than one acre, can only be reached at one point, which makes it a natural fortress, where but little labor would be required to make it impregnable, so that a few soldiers could hold it against all the savages of the west. When the Governor of Canada took possession of Fort St. Louis, all the goods and furs belonging to the traders were confiscated to the government and report says divided between the governor and his friends. Tonti, having at the time, in his possession a large amount of gold, dug a hole within the stockades and buried it to prevent its failing into the hands of the governor. Sixteen years afterwards, as Tonti was about breathing his last, he told a priest who was holding a gold crucifix before his face, about the gold being buried within the fort. The priest kept the matter a secret, waiting for an opportunity to resurrect the gold, but soon after he was drowned in the river by the upsetting of a canoe. The fort was also burned and the French driven away, as previously stated. In the summer of 1765, forty-seven years after Fort St. Louis was abandoned, a party of French at Peoria, among whom were Captain De Fond and Father Buche, believing the story about gold being buried in the fort, came up the river in search of it. They encamped at the base of Starved Rock, and spent many days in digging on its summit. No gold was found, but in a vault near where the store-house had stood, they found a large number of articles designed for the Indian trade, consisting of tomahawks, knives, beads, guns and other articles. The digging for gold on Starved Rock accounts for the many pit-holes now to be seen. This account of searching for gold is given in Father Buche's manuscript, now in possession of Hypolite Pilette, and from which many extracts are taken; Said he, "We had spent five days in digging pit-holes on the summit of Fort St. Louis du Rocher, and found a large quantity of articles which were intended for the Indian trade, but the precious metal ‒ the object of our search ‒ we found none. On the last day of our stay we dug a hole close to the old earthwork, and continued working until it was quite dark, when the devil appeared to us in the form of a huge bear. On seeing this monster we dropped our tools and hurried down from the rock, put our camp kit in the canoe and started down the Illinois River." This story of gold being buried within the stockades of Fort St. Louis, is also among the Indian traditions, and some years ago a party of Potawatomis from Western Kansas came here to search for it. People told them that Fort St. Louis was built on Buffalo Rock, and on it they dug a number of pit-holes, but finding nothing they returned to their homes. How Did "Starve Rock" Get Its Name? The region was periodically occupied by a variety of native tribes who were forced westward by the expansion of European settlements and the Beaver Wars . 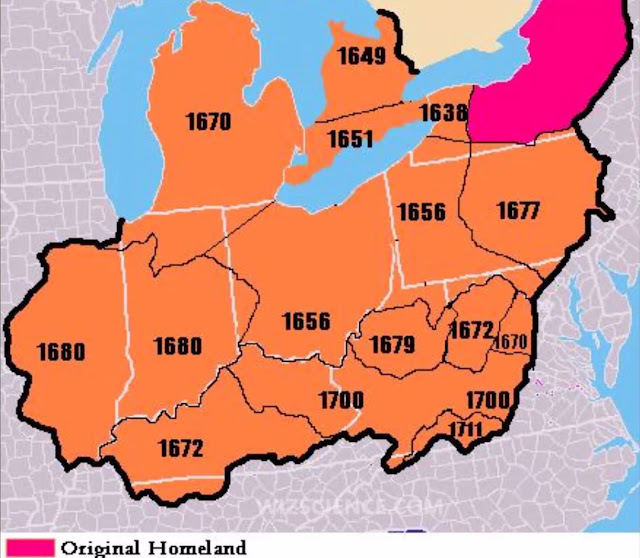 Map of Iroquois tribes territorial conquests by region and year during the Beaver Wars. There are various local legends about how Starved Rock got its name. This is only one of the stories. The Starved Rock Massacre of 1769 - Fact or Fiction is a research article analyzing whether this massacre actually occured. The legend of Starved Rock is a story of an Indian war. At today's Starved Rock area, on the northern shore of the Illinois River, lived a small tribe of the Illinois tribe. In the literature of French and English fur traders, and the stories told by other Indians, the Illinois tribe was known as "the Illinois of the Rock." They lived quietly, farming their gardens, hunting deer, otter, muskrat and beaver. The French called the village across the river from Fort Saint Louis du Rocher both the Grand Village du Kaskaskia and La Vantum ("the washed"), also known as the Grand Village and the Old Kaskaskia Village which was near present Utica, Illinois. A few times a year they traded their furs with the French voyageurs who made regular trips up and down the Illinois River. In the 1760s the Illinois Indians fought the fierce Iroquois who came from the east coast. Later the Mesquakie (Fox), Sac (Sauk), Potawatomi, Kickapoo, and Ottawa Indians from the north and east joined with the Iroquois. The wars were generally short and very dangerous because the Iroquois always involved surprise attacks on peaceful, unsuspecting Indian villages. Lone Indian warriors who crossed the river to hunted small game in the canyons were attacked and killed before they even had a chance to scream out. Women tending the cornfields, unmindful of lurking danger, were hacked to death. When the marauders were discovered, pandemonium reigned in their village. Some of the villagers ran to hiding places in the nearby woods or the canyons across the river. The warriors grabed their weapons and went out to confront the enemy. War cries and death chants intermingled as the battle was fought. It ended only when the attackers were dead, injured or they could not continue to fight, or, they would run. Pontiac or Obwandiyag was an Odawa (Ottawa) war chief who was murdered on April 20, 1769 near the French town of Cahokia. Most accounts place his murder in Cahokia, but historian Gregory Dowd wrote that the killing probably happened in a nearby Indian village. The murderer was a Peoria warrior whose name has not been preserved. He was apparently avenging his uncle, a Peoria chief named Makachinga (Black Dog) whom Pontiac had stabbed and badly wounded in 1766. A Peoria tribal council authorized Pontiac's execution. The Peoria warrior came behind Pontiac, stunned him by clubbing him, and stabbed him to death. Various rumors quickly spread about the circumstances of Pontiac's death, including one that the British had hired his killer. According to a story recorded by historian Francis Parkman in The Conspiracy of Pontiac (1851), a terrible war of retaliation against the Peoria Indians resulted from Pontiac's murder. 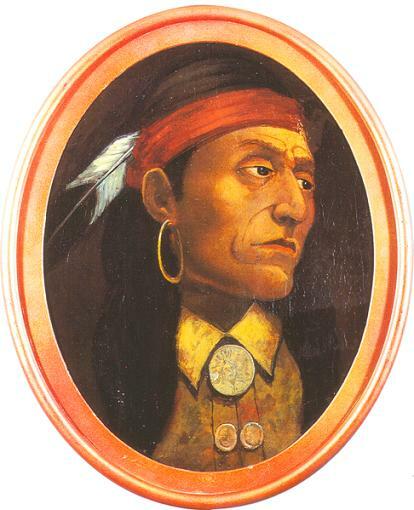 This legend is still sometimes repeated, but there is no evidence that there were any Indian reprisals for Pontiac's murder. The Ottawa tribe was unable to avenge his death. One of his allied tribes, the Potawatomi did, however, set out on the warpath against the Illinois in the fall of the same year. The Potawatomi did not know that the Illinois of the Rock were innocent of the murder when they fell upon the little village. The Ottawa were busily gathering its yearly harvest. Unable to defend themselves when the hostile forces swept down upon them from the paths along the northern bluffs, the Illinois waded across the low waters of the Illinois river and sought refuge on top of the rock. The Potawatomi followed them and tried to scale the steep walls of the rock but were always repulsed. Unable to conquer the Illinois by storming the heights, the beseigers camped at the foot of the rock, determined to wait until the Illinois would be forced to come down. Before long the food supply of the Illinois gave out, and their water supply too, for the Potawatomi were careful to cut the ropes of the water buckets that were lowered into the river from time to time. Three long weeks the Illinois stayed on the rock. Before the first week had passed, they had eaten their dogs; by the time of the third week they were eating grass and bark. Hunger and thirst brought the realization that they must descend and chance a battle or die of starvation. They resolved to sneak through the Potawatomi camp during some propitious night. On the first dark stormy night the procession silently made its way down the steep eastern face of the rock. The first of the Illinois were already passing through the outposts of the sleeping Potawatomi camp when the last were leaving the top of the rock. A mother slipped as she made her way down the cliff, her child began to cry, and the Potawatomi were awakened. The slaughter that took place within the narrow confines of the canyon was horrific. The cries of hunger-worn warriors, too weak to defend even themselves were soon stifled and then silenced. Womanhood and childhood was no defense, for women and children alike shared the warrior's cruel fate. Even those who had returned to the top of the rock were not spared. When all were dead, the Potawatomi returned to their land. Victorious, yes, but grimly appreciative of the horrors that took place in the blood-soaked canyon. It is said that even the victors regretted the clay on which they had shed so much blood. Did any of the Illinois escape? No one knows. Many years later, when Americans were already settled near the rock, visiting Potawatomi told them the tale. One old warrior said that the only person who saved himself was one of the last to leave the rock. When the fighting began, he saw no chance but death in the path ahead of him, so he chose to lower himself down the steepest part of the rock, from which he fell into the river and swam to the farther shore and safety. Others who visited the site in later years said that none escaped. Such is the tale told by the Indians to the first American settlers who chose to live near the rock. Yet, it must be admitted, this story never have happened. As far as is known, this story was first told fifty years after the time it was supposed to have taken place. And the men who told it admitted that it had been told them. Additional Reading: The Starved Rock Massacre of 1769 - Fact or Fiction. Fort Saint Louis du Rocher (Illinois), a French fort later known as Starved Rock. Fort Saint Louis du Pimiteoui a French Fort; AKA: Fort St. Louis II, Fort Pimiteoui, Old Fort Peoria; it was destroyed in 1680 and rebuilt/replaced in 1691. Fort Saint Louis (Texas), a French colony from 1685 until 1688 near what is now Inez, Texas. Fort Saint Louis (Wisconsin), a French fort and North West Company trading post near what is now Superior, Wisconsin. Fort Saint Louis (Newfoundland), Placentia, Newfoundland, Canada. Fort Saint Louis, a fort in what is now Moose Factory, Ontario, Canada. Fort St. Louis (Shelburne County, Nova Scotia), Canada. Fort St. Louis, (or Fort Chambly), a French fort in Chambly, Quebec. Between 1630 and 1700, the Beaver Wars were battles for economic welfare throughout the St. Lawrence River valley and the lower Great Lakes region. The wars were between the Iroquois [aka: Haudenosaunee; People of the Longhouse] trying to take control of the fur trade from the Hurons, the northern Algonquians, and their French allies. The Iroquois were known during the colonial years to the French as the "Iroquois League," and later as the "Iroquois Confederacy," and to the English as the "Five Nations," comprising of the Mohawk, Onondaga, Oneida, Cayuga, and Seneca tribes.